I always share nail-related products from Born Pretty Store with you, so I decided to throw in something a little different this time. They have a huge variety of nail supplies, but they also carry cell phone cases and accessories, stationary items, and many other things. Another product I have from them is a touch-screen stylus. This is currently on sale for .99 cents USD, which is a steal! It normally runs $2.50, though, and comes in four different colors: white, pink, black, and gold. I especially love the convenient dust plug connector on it. It isn't long enough that you can have it attached to your phone and use it at the same time (for iPhone, anyway), but it is very small and compact. I personally love it to use when playing the game Draw Something on my phone because I am terrible at drawing with my finger. 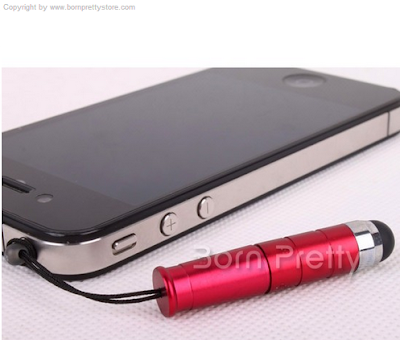 If you need a stylus for your phone or another touchscreen device, I definitely recommend the Born Pretty Store one. It isn't too tiny to hold and control, but not so big it takes up a ton of room either. Plus, it connects to the headphone outlet on your phone for easy keeping, and I love that! Screen shot from Born Pretty Store. See something you like at BPS? 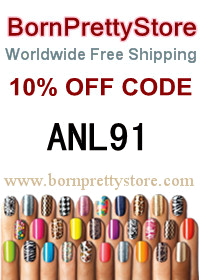 Use my coupon code ANL91 and you'll get 10% off your order! This product was provided for my honest review from bornprettystore.com.